David Lean’s “Madeleine” (Rank Organisation, 1950) is a reasonably engrossing, if mildly dull, suspense tale set in Victorian Glasgow. Two men vie for the same woman; one of them ends up dead of arsenic poisoning. The story is based on a sensational murder trial that made headlines in 1857. Ann Todd, an attractive but extremely unsympathetic screen presence, plays Madeleine Smith, the seemingly docile eldest daughter of a stern father (Leslie Banks), who finds herself being wooed by an upstanding, earnest young man (Norman Wooland) of whom her father entirely approves, while she is secretly in love with a French chappie (Ivan Desny). Although the action takes place in Glasgow and there are a few Scots accents scattered throughout to remind us where we are, this is an English picture through and through. It is therefore a foregone conclusion that the mysterious Frenchman to whom our heroine has lost her heart is a bounder. The Englishman’s traditional disdain for his Gallic neighbor has been making me laugh for as long as I can remember. I cannot defend it, but neither can I help it: it’s funny. This Frenchy is particularly odious. His very name, Emile L’Angelier, seems to have been purposely devised to confound an English gentleman’s best attempts to pronounce it (the last name is misspelled in the credits). What’s more, this alien cad is clearly only after the girl’s money and position. When she realizes the truth about her paramour and demands that he return her letters, the sprat-eating brute turns to blackmail as a first, rather than a last, resort. The strain he puts on Miss Smith’s nerves almost reaches the breaking point when, handy dandy, he collapses outside his bed-sitter and dies the following morning, leaving Miss Smith’s billets-doux unreturned and his landlady’s bill unpaid. Anyone would think he was a Hollywood agent. On the whole, the picture is very well acted, especially in the smaller roles. Ann Todd is glacial and pinched, as was ever her wont, but in this role her frosty discomfort seems appropriate, though certainly not inspired. On the other hand, André Morell, as her barrister, the noted advocate John Inglis, Lord Glencorse (in the picture, his character is listed in the credits as “Dean of Falcuty” [sic]), is truly inspired and memorably wonderful. His remarkable performance and the magnificent rhetoric Nicholas Phipps and Stanley Haynes have given him to speak are the subject of this essay. He begins his summation with the classic rhetorical device known as aporia (from the Ancient Greek ἀπορία: “impasse, puzzlement, being at a loss”), in which the speaker expresses his uncertainty about whether he will prove equal to the difficult task before him. I also draw your attention to another rhetorical device, used with exquisite finesse: dysphemism, which is the antonym of euphemism. 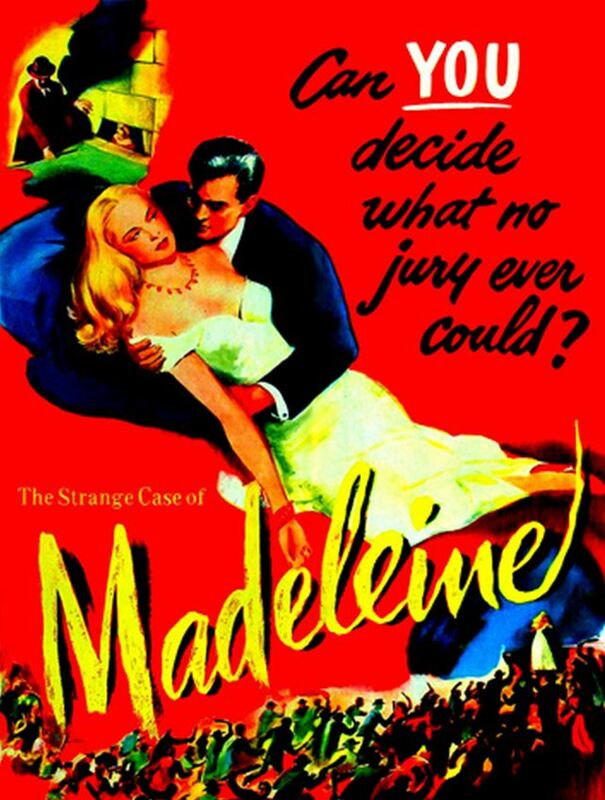 Madeleine Smith is charged with murder, a capital crime, punishable by hanging. In 1857, this was a commonplace, but listen to the language Lord Glencorse employs to describe it. It is as fine an example of dysphemism as I know. He uses the device again at the end of this clip, when he speaks of the prosecution’s case. The rhetoric alone is enough to make me admire this speech, but Morell’s performance makes it entirely thrilling. Some critics suggest that aporia is used to express a feigned doubt, but since aporia’s near synonym, dubitatio, specifically refers to the pretense of doubt, I prefer to restrict aporia to genuine (if misplaced) doubt, as it is in this case. 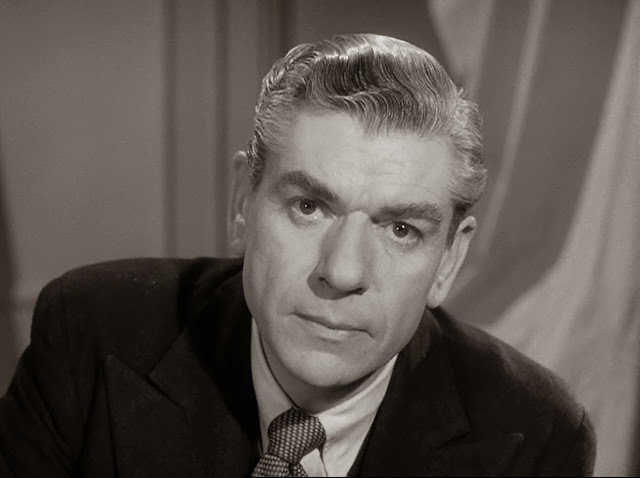 One sees from André Morell’s masterful performance that Lord Glencorse is more than equal to the task before him; he employs aporia simply as an honest admission of his perplexity, while his misgivings indicate a most becoming modesty in the face of so terrible a responsibility. For that is the twin-purpose of aporia: to excite in one’s audience a feeling of sympathy for the speaker, and to establish the immense difficulty of what the speaker intends to convey. Shakespeare built the entire prologue to “Henry V” on aporia; Lincoln used the device to great effect in his address at Gettysburg and in his famous letter to the Widow Bixby. By contrast, there is a fine discussion of dubitatio (though it is not mentioned by name) in Nunnally Johnson’s screenplay for “The Man in the Gray Flannel Suit,” in which business tycoon Fredric March proposes to lard an important speech to a group of doctors with a lot of “Aw shucks, I ain’t no expert, gentlemen” folderol (i.e., dubitatio). All the yes-men in his employ express their enthusiasm for his Sage of the Cracker-Barrel pose, but then he runs the idea past that tall, marble allegory of Honorable American Manhood known as Greg Peck, who objects to March’s whole approach. March asks what’s wrong with it. Peck frowns and swallows hard: “Now, maybe I’m one hundred percent wrong, but it seems to me” — as arrant an example of dubitatio as one could hope to trip over — and then he goes on to make a clear and cogent case against the use of false modesty. “The worst part of it to me is a statement made over and over again that would only make me sore . . . because it’s so obviously untrue: that you’re a very simple, uninformed man who, in effect, doesn’t really know what he’s talking about. Because if they believe that, why should they ask you to be head of this campaign? But they’ll know better: they’re educated, intelligent men, and they’ll know who and what you are. And that whole part of it will have a completely phony ring at the very moment when sincerity is the thing you’re aiming at above everything else.” As irony would have it, Peck speaks this well-reasoned, carefully worded critical rebuke of false modesty while giving a stammering, gulping, artificial performance full of actorish/NPRish hesitations. As I remember it, his Adam’s apple makes like a pogo stick. Perhaps my memory is playing me false, but that is the effect of his performance: the earnest faking of sincerity. When Lord Glencorse expresses his misgivings, there is nothing phony or foot-dragging about it. He is genuinely oppressed with doubt; his anxiety does him credit and elicits kindly feelings from his audience. He employs aporia, not dubitatio. His dysphemistic description of the prosecution’s aims contains a number of rhetorical elements that enliven and ennoble it and give it balance: “You are invited and encouraged by the prosecutor to snap the thread of this young life and to consign to an ignominious death on the scaffold one who, within a few short months, was known only as a gentle and confiding and affectionate girl.” The verb phrase invited and encouraged has a delicious connotation of a tea dance or a race ball or a charity rout to which subscriptions are being offered for purchase. By using verbs that evoke such gay and genteel dissipations, the defense makes the prosecution’s goal appear utterly monstrous. Then to snap the thread of this young life ennobles the sentence with a classical allusion to the Fates (Ancient Greek: Μοῖραι, Moirai: “apportioners”). In Greek mythology, the Moirai were three sisters: Clotho (Κλωθώ: “spinner”), who spun the thread of life from her distaff onto her spindle; Lachesis (Λάχεσις: “allotter”), who measured the thread; and Atropos (Ἄτροπος: “unturning, inexorable”), who cut the thread of life. Though such an allusion would surely mystify the vast majority of a modern audience, in 1857, it would have been readily understood and undoubtedly very potent. (The educated audience of 1950, for whom the picture is obviously intended, would have recognized the allusion as well.) The two ands at the end — gentle and confiding and affectionate girl — are an example of polysyndaton, which gives a nice balance to the end of a long and complicated sentence. As for André Morell’s delivery of the line, his mastery speaks for itself. I have little to add, other than to say that he does not rush things along, neither does he luxuriate. As will be seen the next clips, it is a big performance, but it is too refined and magnificent to be thought of as ham. Note that Morell’s sweeping arm gesture at approximately fifty-five seconds into the clip could hardly be more theatrical: it is almost panto. François Delsarte, who developed the once popular Delsarte System — an extravagant, systematized set of gestures and facial expressions in the years immediately preceding the dawn of motion pictures, and used by many actors of the Silent Era — old Delsarte himself would have approved. Yet the first few times I saw Morell’s performance, the gesture went by almost unnoticed because the actor had by this point completely engaged my attention and persuaded me of his sincerity. If I noticed it at all, it was simply that its splendid rightness gave me a little jolt of excitement. But how many actors could get away with it? Very few, in my experience. Olivier, for instance, was much given to such theatrical gestures, and they worked. But with Olivier, you’re always aware that you are watching him act. I’m not knocking him, it’s just that I never quite believe him: I like Olivier for his theatricality, not for his realism or sincerity, of which he has but little. Morell is both theatrical and realistic. I cannot hear this oration without feeling the urge to leap to my feet and give André Morell a standing ovation. Lord Glencorse makes Atticus Finch look like a pisher. Had his lordship practiced law in Alabama, poor Tom Robinson would still be chopping up chifferobes today. If you want to see all four clips play one after the other, click below. This entry was posted in Main and tagged Abraham Lincoln, Andre Morell, Ann Todd, Atropos, Atticus Finch, Bixby Letter, Clotho, David Lean, Francois Delsarte, Fredric March, Gettysburg Address, Gregory Peck, Henry V, Ivan Desny, John Inglis, Lachesis, Laurence Olivier, Leslie Banks, Lord Glencorse, Madeleine, Moirai, Nicholas Phipps, Nunnally Johnson, Stanley Haynes, The Man in the Gray Flannel Suit, Tom Robinson, William Shakespeare on May 17, 2015 by TR. 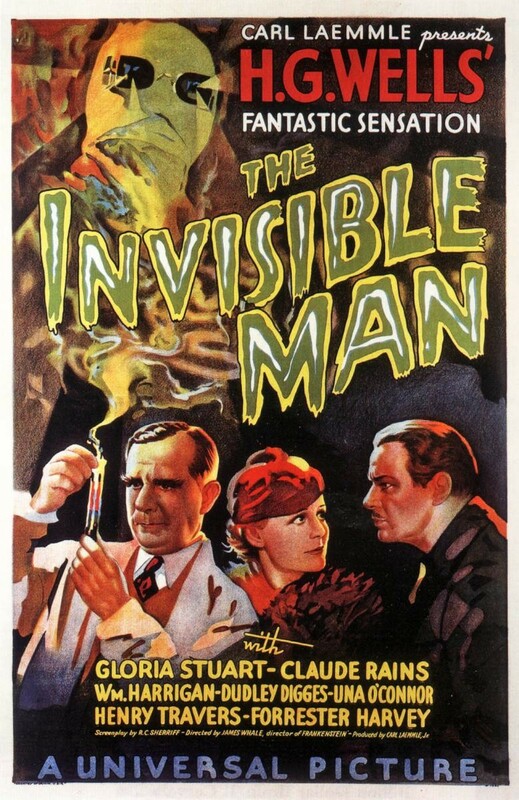 Claude Rains made his Hollywood debut in “The Invisible Man” (Universal, 1933). In an irony worthy of the man himself, he played the leading role in a picture he doesn’t appear in, and it made him a star overnight. Every time I watch “The Invisible Man,” Rains’ performance reminds me why he will always be my favorite actor. In scene after scene, I find myself thinking, “Who else would even dream of reading the line that way? Who else could read it that way?” One of the hallmarks of Rains’ acting style is his stupendous gift for infusing humdrum dialogue with life and wit, for making “heavy ignorance aloft to fly” — but he’s hardly the only actor with such a gift. Walter Huston, a great leading man who became one of Hollywood’s finest character actors, put it this way: “Hell, I ain’t paid to make good lines sound good. I’m paid to make bad lines sound good.” Spinning leaden text into gold is what great actors are supposed to do. Many fine actors — William Powell, Melvyn Douglas, Ralph Richardson, to name but three — rival the Immortal Claude at making bad writing sound better than it is, though none surpasses him. Some great actors — Olivier, Gielgud, Plummer, for instance — nearly always make bad material worse by failing to conceal their contempt. 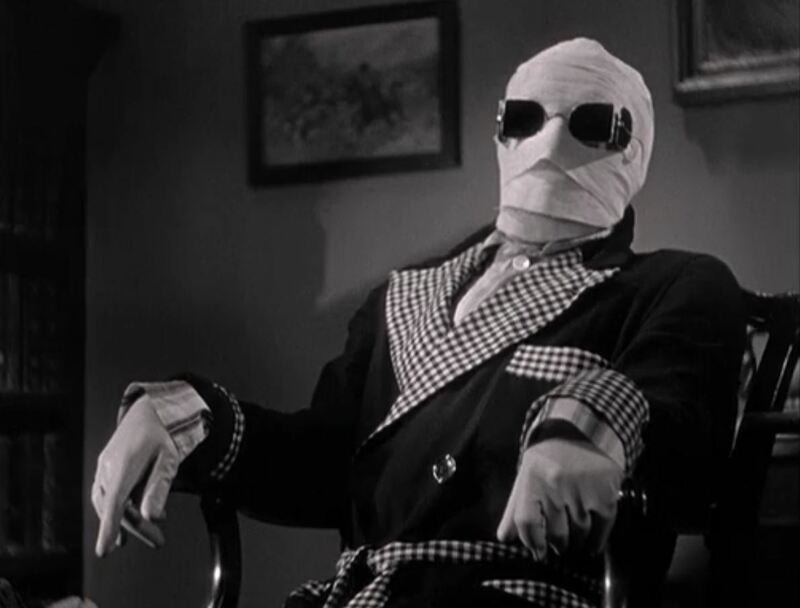 Keeping under wraps: Claude Rains as Dr Jack Griffin, the Invisible Man. I know of only one time when Claude Rains made a bad part worse (as the pixieish father of “Four Daughters”). His mistake was to play up the sickening coyness, instead of playing against it. Some years later, when it was remade as a Frank Sinatra/Doris Day musical, “Young at Heart,” cadaverous, bleary-eyed, thin-skinned Robert Keith played the role. Keith was a journeyman hack, but he played that one rotten part better than Rains; Keith had no imagination and very little skill, so he said his lines quickly and got out of the way. In “The Invisible Man” Rains never puts a foot wrong. It’s one of the greatest debuts in movie history and one of his very best performances. “I want a room and a fire.” Those are the first words Claude Rains ever spoke in a motion picture. James Whale shoots him from below, which makes his entrance immensely impressive. And a few moments later, you hear The Voice — with all the velvet and gravel in it. There’s not another voice I’d rather listen to. Rains always said that the sound of his voice was mostly due to the damage done to his throat and vocal cords by a gas attack while fighting in the Great War. Rains entered the London Scottish Regiment as a Private, along with Basil Rathbone, Ronald Colman and Herbert Marshall; at war’s end, he had risen to the rank of Captain. The gas attack left him nearly blind in one eye for the rest of his life. The fabulously antic landlady is Una O’Connor, who gave essentially the same performance throughout her entire career. Her publican husband is Forrester Harvey. One of the only objections H.G. Wells had about the adaptation was that his scientist, as written by R.C. Sherriff and portrayed by Rains, was mad from the moment he arrived, rather than slowly going out of his mind. It’s certainly true that in the screen version, Dr Jack Griffin (in the book he’s known only as Griffin) has a volatile temper from the moment he enters the inn, but it doesn’t look like madness to me. I’d say he becomes increasingly erratic over the course of several weeks. His mind begins to crack when the landlord tells him to pay up and get out. “I implore you to let me stay! I beg of you!” he cries with the heavy tremolo and sob of a stentorian Nineteenth century ham pitching his bathos to the last row of the gods. I can hear the ghost of Sir Herbert Beerbohm Tree (Rains’ first theatrical mentor) in the way he delivers that line. The old-fashioned declamatory techniques he uses, the showy theatricality of his acting style (what Christopher Plummer calls, with a graceful sweep of the arm, “the Grand Manner!”) and, above all, his white hot intensity make it an audacious performance. When you remember that this was his first Hollywood picture (and only his second picture ever: the first was a silent he made in England in 1920), his audacity is almost beyond belief: how easily it could have gone wrong! And that’s the second hallmark of Rains’ acting style: outrageousness, backed by superb technical skill and absolute commitment. In “The Invisible Man,” the violence of his first outburst is so explosive, it’s hard to believe he’ll be able to surpass it. He does. As a demonstration of technical skill, Claude Rains’ sustained temper tantrum in “The Invisible Man” is hard to beat. He may be the only actor I’d ever want to see play Timon of Athens. In this next clip, the local constable (E.E. Clive, in a very funny performance) comes to the inn to restore order and to ask, “‘ere, wot’s all this, then?” E.E. Clive always lifts my spirits. This is the first time we get to hear the full Rainsian cackle. Once he begins to cackle, that’s when it is clear that his most sovereign reason is now blasted with ecstasy. You can hear torment in his famous cackle, which has been endlessly imitated. Mimics usually can reproduce Rains’ pitch and volume accurately enough, but nobody ever gets the brain fever and the fury that is in Rains’ shrieking laughter. It’s grandly theatrical — funny and thrilling at the same time — but there’s great passion in it too. These next two clips show Rains hatching his very nasty schemes. His authority absolutely amazes me. William Harrigan is the terrified wretch whom Rains is pressing into service. Harrigan is very good, but the plain fact is that even though you can’t see Rains, you can’t take your eyes off him. In this clip, Rains speaks to his fiancee about his plans. Though besotted with love for him, the young woman can plainly see he is barking mad. My favorite line is Rains’ response to her speech that begins, “Jack, I want you to let my father to help you. You know how clever he is.” Or, more accurately, his response is my favorite line reading. It’s a perfect example of the way Rains has of putting great zest and pizzazz into a line of no great merit. “Your father, clever? You think he can help me? He’s got the brain of a tapeworm, a maggot!” The energy and heat Rains puts into that line gives me a thrill every time I hear it. His scorn for her father’s intelligence is so ferocious, and his indignation at the comparison is so extreme — all I can do is laugh. What makes it even more hilarious, he is, after all, speaking of her father. Calls him a tapeworm, a maggot. What is he, nuts? The girl is Gloria Stuart. This entry was posted in Main and tagged Basil Rathbone, Christopher Plummer, Claude Rains, David Lean, Doris Day, E.E. Clive, Forrester Harvey, Four Daughters, Frank Sinatra, Gloria Stuart, H.G. Wells, Herbert Marshall, James Whale, John Gielgud, Laurence Olivier, Melvyn Douglas, R.C. Sherriff, Ralph Richardson, Robert Keith, Ronald Colman, Sir Herbert Beerbohm Tree, Stella Adler, The Invisible Man, The Passionate Friends, Timon of Athens, Una O'Connor, Walter Huston, William Harrigan, William Powell, Young at Heart on October 30, 2014 by TR.